Are you ALL IN for Sand Point Elementary’s Library? 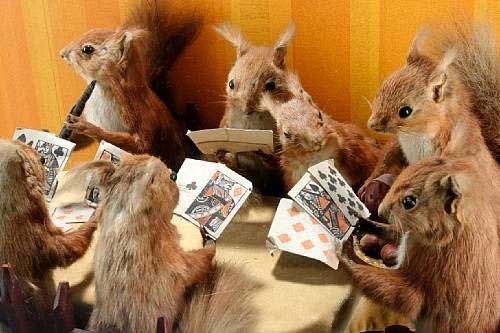 Join us for the Seventh Annual Squirrel Cup No Limit Texas Hold 'em poker tournament! It's a great night of socializing without the kids, and playing poker all for the Sand Point Elementary Library (all proceeds directly fund books and supplies for the 2018/2019 school year). Let’s show our school Librarian, Sean Harvey, how much we care! 21 & Over Only. Maximum number of participants is 30. Sign up now! All skill levels welcome. Hearty snacks and drinks provided. Winner goes home with an awesome trophy! The cost to attend and play in the tournament is $100 per person. If you’ve never played poker, don’t worry. There will be a 30-45 minute poker tutorial to learn the ropes. If you get knocked out of the tourney, you will be able to continue to participate by making an additional donation(s) (as many times as you want!). This is a casual event at Emily and VK's home. So dust off your old flannel shirt or wear your favorite hoodie and sunglasses to join us for another great night to support all students at Sand Point Elementary. Hosted by Emily Darby, VK Gadi, Eric Shamay, and the Sand Point Elementary PTA. Can't make it but want to support the library anyway?! You can! Click on the "Give To The Library" button and make a financial contribution to the SPE library.